We have our first FED meeting of 2019 this week, where we will see if the FED is going to continue its “dovish” stance that it took toward the end of last year, or if it will continue to back off now that the market is improving. As we have said so many times, it is very difficult to run portfolios based on whether the FED will come in and support the market should it go into a decline. It has done so many times dating back to Alan Greenspan and the “Greenspan Put.” Jerome Powell was going to be the FED Chair that was more hawkish and willing to separate monetary policy and the stock market, but that is now being called into question. One good selloff and we see how “hawkish” he really was (not very). Regardless of FED policy, the next business cycle will put extra pressure on the overall economy because of unprecedented levels of corporate and government debt. Remember 2008, consumers were ground zero for over-leverage that centered around the housing market? That leverage had second and third order effects on banks and financial institutions. Today, the center of overleverage is in the lower end of the investment grade corporate bonds. If (when) we have a turning of the business cycle, you will see those companies suffer the most. They are the most overleveraged, with the weakest cash flow and ability to pay those bills. When a good percentage of them are lowered to ‘junk bonds,’ most pensions and endowments cannot buy them and will be forced to sell them, putting pressure on prices and making it more difficult to refinance or get additional financing to support their cash flow needs. Eventually the FED will begin to lower interest rates with the intent of raising bond and stock prices and making it easier for those weaker companies to finance operations. Some of those ‘zombie’ companies will not make it and investors will be crushed. If we look at where the markets are today, and where we expect them to go in the near future, we need to take a look at the charts. We saw the market rebound to the levels we had previously discussed, in the 2570 – 2620 range, with a possibility of 2700 on the S&P 500. Right now, we are sitting on support of the 50-day moving average and if we break that (2612 as of today), we would expect that is the start of our re-test of the December lows. There is still a chance that there is more upside; although, as you can see in the following chart, we are overbought and starting to turn down in the momentum indicators. In addition, we expect that earning expectations are still too high for the rest of the year, and as companies report, you will see future guidance come down. If you are a CEO of a major company, why not use everything that is going on as an excuse to reset expectations? China, government shutdown, world economies slowing, etc. Plenty of reasons and your shares won’t get unduly hurt because of the reset. As always, our model is working to reduce the impact of these ripples on your financial future. We continue to be conservative into the re-test that we expect, based on historical evidence, to happen in the next month or so. At the same time, we are getting a favorable risk/return from the current allocation. Mostly keeping up with the markets on up days, and significantly protecting on down days. 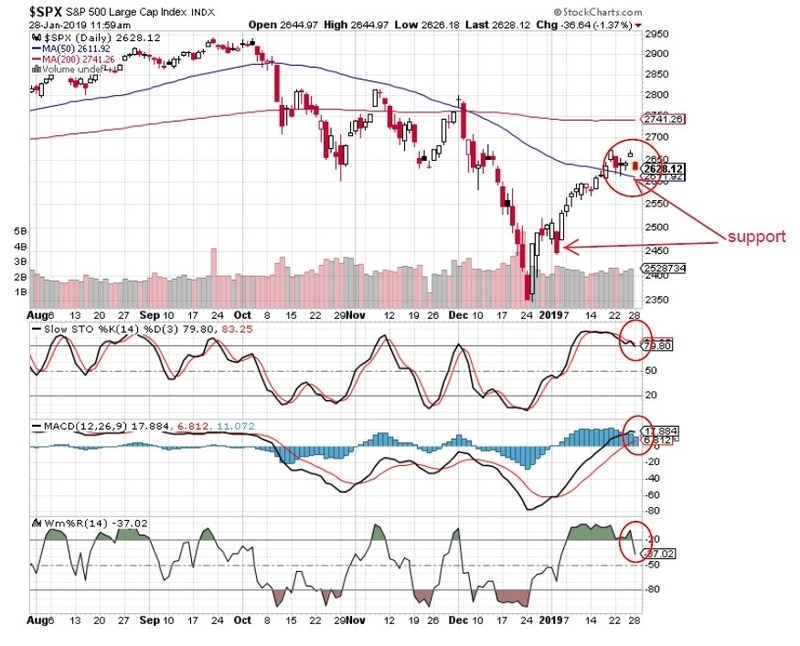 While we do not really like to be super tactical, we see this re-test as confirmation that the downside is played out for now and a real rally in the market potentially re-testing last autumn’s highs. We will obviously be following that closely and is subject to change as we go along. As we head into the fall and into 2020, we could see a real turn in the business cycle and a subsequent ugly market. Rest assured, we are following things closely with the goal of conserving your assets during bad times and redeploying in better times. Remember, we have never professed to know where the exact tops and bottoms are. We do not believe anyone can do that. We are only trying to find either the uptrend or downtrend and adjust portfolios appropriately.